Somewhere in between a weekend escape to Chicago and a reunion with my best friend coming back from South America, there was an extended weekend thanks to a bank holiday. Lucky me that I am based in Vienna for the spring, I am also able to benefit from Austria‘s many bank holidays, whereas Lausanne is a working city full of stress and not even a single bank holiday all over the most wonderful season of the year. Well, not debating why Vienna is the number one city in the world to live in - it‘s all about the weekend getaways. Flying for your smile was never easier when you work near the airport for six months, so obviously it took me 30 minutes from the work desk to seat 6D en route to Milano Malpensa airport. Yes, that one airport that is one of the furthest city airports in the world. Having touched down, I was grabbing a Fiat 500 convertible to fulfill my Italian Dream. My colleague Niklas joined me for the trip and soon afterward we were driving down the ridiculously expensive highway direction sea. Having passed Parma and La Spezia, we were approaching the pretty seaside town of Forte dei Marmi, what seemed to be the Hamptons of Italy. Driving down the driveway of Augustus Hotel, we were peaceful for a moment inhaling the pretty structure and gardens. Parking the car was easy and within a minute we were greeted by the Guest Relations Manager of the property who checked us in and took us on a tour of the hotel. Maybe we skipped the welcome drink (that would have suited just perfectly) and were shown around the hotel before the friendly lady in black suit accompanied us to the beautiful and recently renovated room. Even though the hotel is still the same from outside, it has been completely renovated and now offers state-of-the-art technologies, better WiFi coverage, and brand new bathrooms. The only thing reminding of the good old days is the air conditioning which seemed not to work during our stay or maybe it was due to the cold temperatures at night so opening the window did the work. That‘s one of the huge advantages when staying at a resort in Italy - you can sleep with open doors and don‘t need to worry about anything. 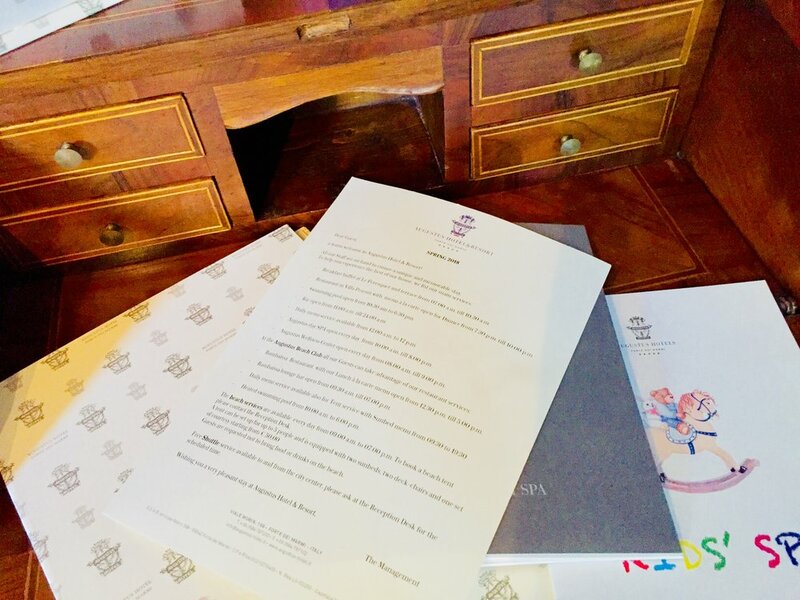 Our Deluxe Room had two extremely comfortable single beds with excellent bedding and linens, a walk-in wardrobe with a big safe, a writing desk plus a sofa that could be turned into a third bed as well as an armchair and table in the center of the room. There was a massive terrace with dining table as well as two lounge chairs overlooking the pretty gardens. 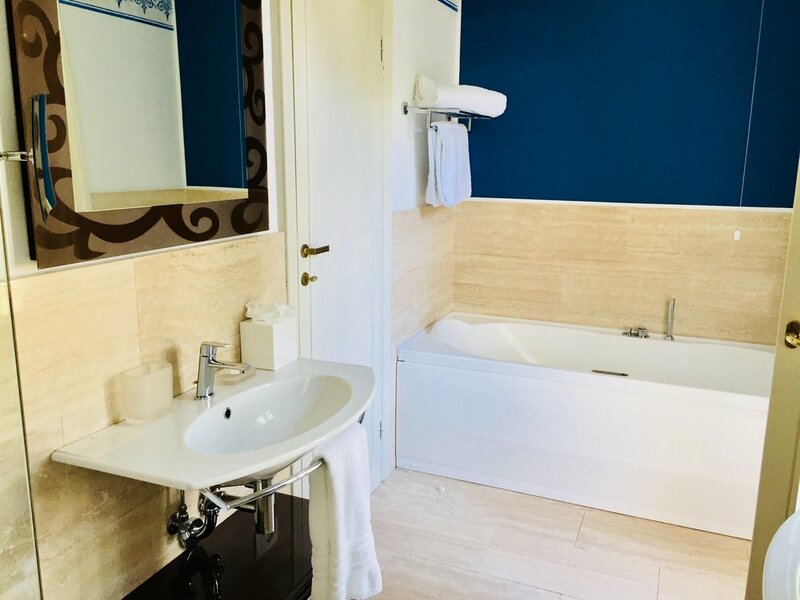 On the other side of the room was the spacious and light-filled bathroom with double vanities, Jacuzzi tub overlooking the gardens, toilet, and bidet as well as a separate shower. 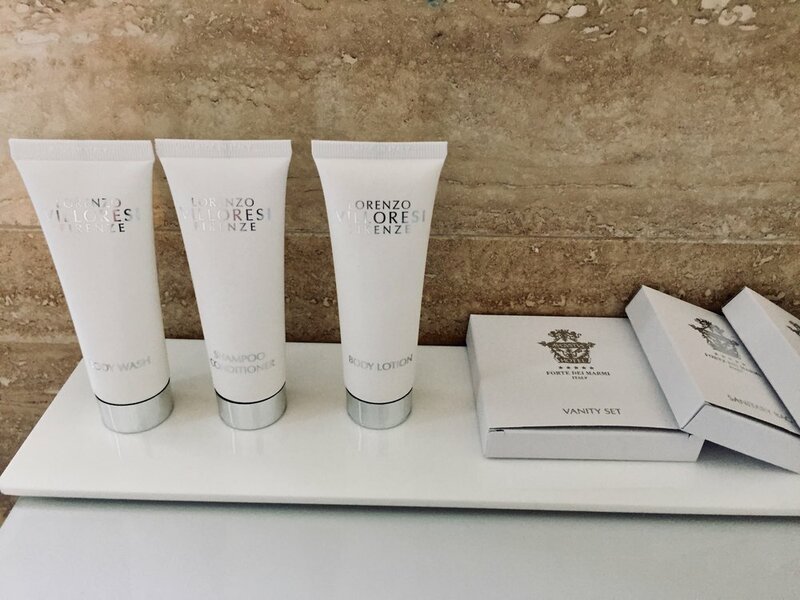 All toiletries were branded by upscale Florence-based perfumer Lorenzo Villoresi and perfectly matched the surroundings. Housekeeping was coming to the room twice so we always had fresh towels and new toiletries. 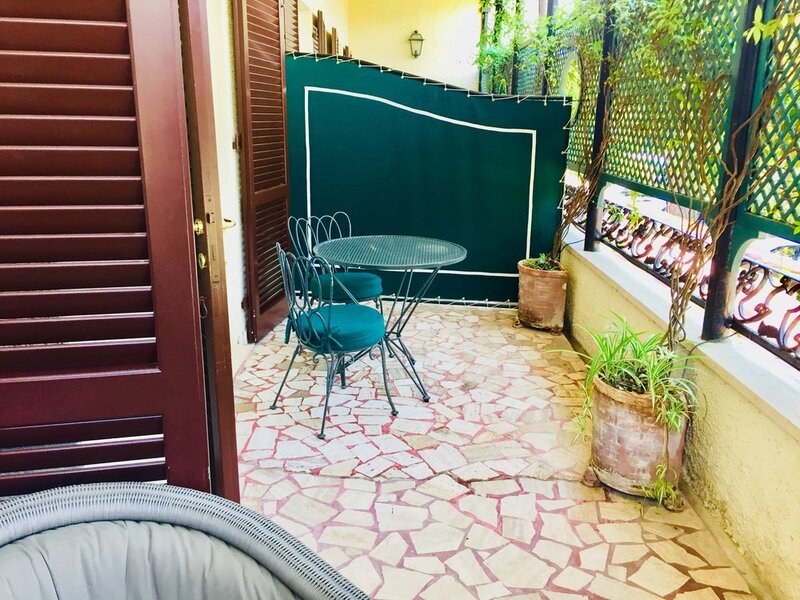 The highlight was the balcony in the bathroom just because it is nice waking up, getting fresh in the bath while enjoying the sound of the birds as the wind breezes through the door. The first thing you realize is the smell of pine trees and freshly brewed coffee from the restaurant terrace right below. I mean getting up was harder. Once we were all set, we changed into the beach outfit and were again shown the way to the beach club by the guest relations manager. Actually, Hotel Augustus is split up into the hotel part consisting of a few villas and the Nave building and the Lido part - an old villa that once belonged to the founders of Fiat who made Forte Dei Marmi to the celebrity hotspot it is nowadays. So you can consider Hotel Augustus as the birthplace of the Tuscan Riviera jetset. A hidden tunnel leads from the Augustus Lido (which is across the street from Hotel Augustus) under the main street to the amazing beach club. Tommy Hilfiger himself couldn't have done a better job - the design of the Augustus Beach is just perfectly matching the look and feel of this pretty place, frequented by A-list celebrities throughout the summer season. The heart of the beach club is the Bambaissa restaurant with its bar as well as the pretty changing cabins along the heated saltwater pool. All staff members at the Augustus beach were extremely friendly! No idea if it‘s because their workplace is one of the prettiest in the world or they love their job. The hostess welcoming us was so friendly and always remembered our names - it was fun talking to her. Also, the lady allocating the cabana was super-friendly and even tried to find the missing ball in order for us to play beach Pingpong. When we selected our cabana we were impressed as it‘s the first time we had this kind of beach setup. Inside the cabana were two chairs, a dining chair, two sun beds along with a table that could be locked so you can stow all your personal belongings and don‘t need to worry should you fall asleep. Some people may be disturbed by the beach vendors that even pass Augustus Beach - since it is an area belonging to the public - should consider it as a normal thing. For me, it‘s part of these huge beaches and since they are not offensive at all, I was absolutely fine with the three passing. As soon as we were ready to sunbathe, another friendly staff member arrived and asked if we would like to have a drink. So before we could even enjoy the sun, we had a lovely talk with the waiter who brought us a chilled bottle of sparkling water. You can guess it already, I was so impressed by the design of the club that I wanted to have lunch on the terrace of the Bambaissa restaurant. Therefore we also wrote a piece about the restaurant H E R E ! 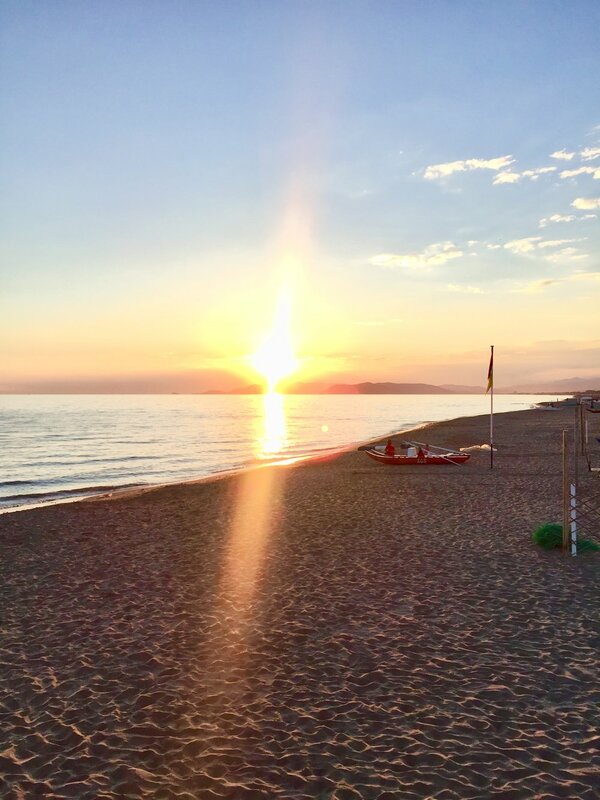 After lunch, I dipped into the Mediterranean sea for the first time of the year (it was 20 May) and was totally refreshed when I left the beach club for the spa where I scheduled my massage at 5 pm. A very genuine lady was welcoming me and showing the way towards the treatment room. I received a 60-minutes full body massage that was much better than expected at the beginning. She focused on all pain areas and even refreshed the feet after the treatment which was a nice touch. As usual at these exclusive holiday resorts, the treatments are quite pricey but the quality is still good and no bad surprises are to be expected. Of course, it was time for an Aperitivo and I decided to take advantage of the hotel's complimentary shuttle into the heart of Forte dei Marmi. What's better than to have a seat at one of the several bars on the main squares, order a Spritz and being served a tray of hors-d'oeuvres while you can just sit back and start people-watching. 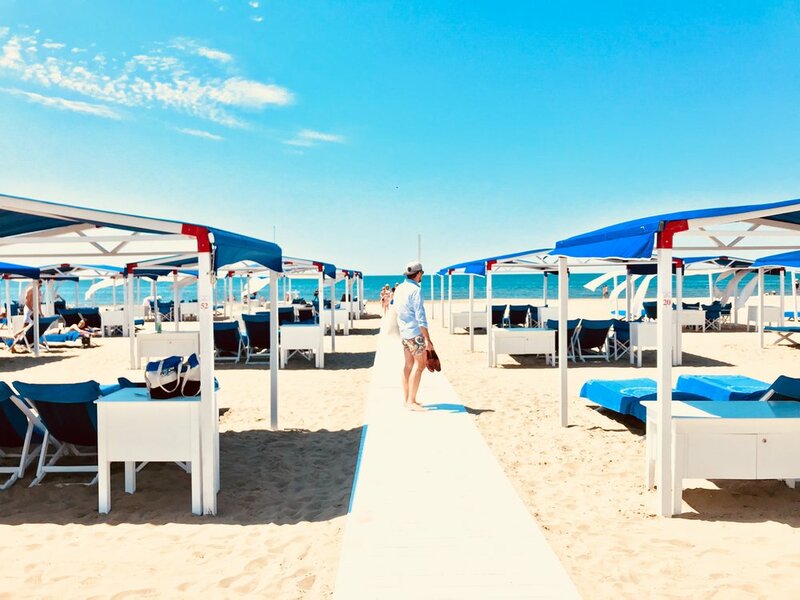 Forte dei Marmi boasts interesting views from fashionable young crowds, Italian entrepreneurs and high-profit CEOs to millionaires in their best ages with pretty accompanying. Linen and yacht-style is definitely an appropriate attire not to look underdressed in one of the prettiest seaside towns of Tuscany. Both evenings, I had dinner at the hotel's main restaurant which I think is a great opportunity during low season as the town tends to desert out in the late hours whereas during the summer season there's party until the early morning. Your guess is correct, I didn't manage to party "Forte" since I was tired of swimming, sunbathing and cycling around the Tuscan Riviera already. Well, I was rewarded with a breakfast that was a solid 10 out of 10 - even for Italian standards. Spread over two rooms it was definitely one of the biggest breakfast buffets I have seen in a luxury hotel in Europe with everything you could dream of - literally. The only downside was that the Eggs Benedict were charged extra at 10 euros and before I could even order one to at least get a feeling for the breakfast dishes, I found myself completely full having had Focaccia, best Prosciutto, and fresh Mozzarella. I was also happy to find homemade jams, warm pancakes, scrambled eggs, a vast selection of fruits and amazing cakes and sweet dishes - yes I could easily go back for the breakfast. 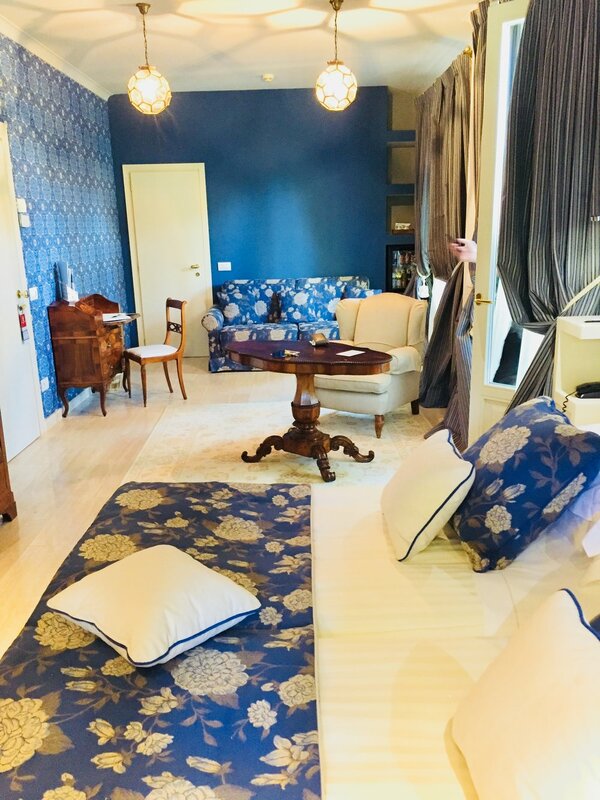 Check-out was without any hassle and in general, the stay at Augustus Forte dei Marmi was a totally great 9 out of 10. I came home extremely relaxed and even managed to get a nice tan. A purely successful weekend so to say. We were guests of the Hotel Augustus and therefore hosted for the weekend. Nevertheless all above written expresses our own opinion and has not been influenced.